Meghalaya state animal ‘Clouded Leopard’ was chosen as the mascot for the upcoming National Games to be hosted by the state in 2022. At the first meeting of the Executive Committee of the National Games 2022 chaired by Meghalaya sports minister Banteidor Lyngdoh in the presence of officials from various departments on Monday, the members agreed that ‘Clouded Leopard’ will be the mascot for the National Games and a competition to design a smiling Clouded Leopard will be opened to all. The meeting also decided that a competition will be opened to all to finalise the logo and the theme of the National Games which will be conducted by the Information and Public Relations department along with the Education department. To finalise the number of sporting events, venues and sports infrastructure, it was agreed that Sub-Committees would be formed to be headed by the Chief Executive Officer of the Games Secretariat who will then submit a report to the National Games Organising Committee. Chief Minister Conrad K. Sangma is the chairman of the National Games Organising Committee. 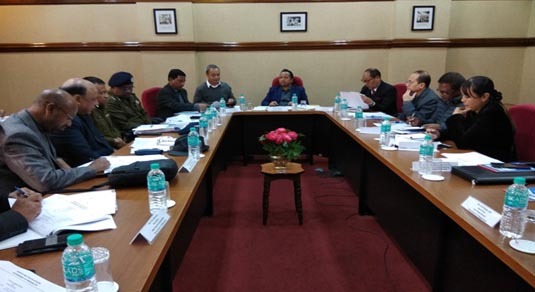 During the meeting, working president of the Meghalaya State Olympic Association (MSOA) suggested that participants in the National Games be also identified from among the police personnel and the Director General of Police (DGP), R. Chandranathan agreed to talent spotting in the police department. It was also discussed that the Home (police) department will give incentives to sports persons and a policy to implement the same will be drafted by the department. The Meghalaya sports minister informed the members that the main stadium will be funded by the Ministry of Social Justice and the stadium will be constructed in a government land of approximately 50 acres at Mawdiangdiang. It was also agreed that 64.34 acres of land will be acquired from MUDA to construct the Games Village. A total of approximately 114.34 acres of land has been identified for critical infrastructure for the National Games. The NIC along with the IT department will develop a website for the National Games. The members were also informed that an interim chief executive officer of the Games Secretariat, Peter Sansan Dkhar, has already been notified by the government. “The Master Plan will be compiled by the Director Sports and Youth Affairs department and submitted to the of National Games Organising Committee chairman (Chief Minister) in the first week of May this year,” an official statement said. The meeting was attended by chief secretary Y. Tsering, additional chief secretary, P.W. Ingty, principal secretary (Sports and Youth Affairs), Donald Phillips Wahlang, besides DGP, R. Chandranathan, additional director general of police, H. Nongpluh, CEO of Games Secretariat, and other officials from the state PWD roads and buildings, working president and general secretary MSOA, deputy girector general, NIC, Timothy Dkhar, and chief engineer of the State Sports Council.